Since the whitefish, a little native fighter, is so maligned in the fly fishing world, we have to give him a little “face time”. 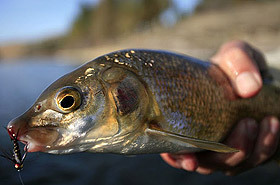 The whitefish is a native salmonid that, like the native bull trout, only lives in good water with a healthy eco-system. This little guy showed up on its own, it belongs here, it eats bugs so it eats flies, fights hard, and is a lot of fun to catch, until most folks figure out it’s a whitefish. The whitefish certainly is not as pretty as any of its trout relatives. It doesn’t have the aerobatics of the rainbow trout, or the predator instincts of the brown trout. OK, it smells pretty fishy too so we don’t target this fish, but you are going to catch some. So, set the hook, play the fish, sit back and enjoy it!